The UK's My Digital Enemy have been on fire recently with releases on labels such as Skint Records, Wall Recordings, Toolroom Records, Stealth Records, Hotfingers and their very own Zulu imprint throughout 2012. 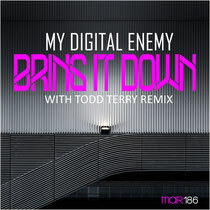 Their recently released ‘Bring It Down’ track is a massive slab of house music with a good vocal and comes with a remix from Grammy nominated DJ/producer Todd Terry. Todd Terry is one of the original house music pioneers and has worked with many huge artists over the years, including Bloc Party, Rolling Stones, Michael Jackson, Jamiroquai, Usher and Tina Turner. His hit list is equally impressive too with classics such as 'I'll House You', 'Keep On Jumping', 'Can You Party' and countless others that have become the cornerstone of today's music. Just released on Friday, you can check the video out below. hey there and thank you for your info � I have definitely picked up anything new from right here. I did however expertise some technical issues using this website, since I experienced to reload the site many times previous to I could get it to load properly. I had been wondering if your hosting is OK? Not that I am complaining, but sluggish loading instances times will sometimes affect your placement in google and can damage your quality score if advertising and marketing with Adwords. Anyway I am adding this RSS to my email and could look out for a lot more of your respective fascinating content. Ensure that you update this again soon.